4402 ∆ 43y 1 Mk. 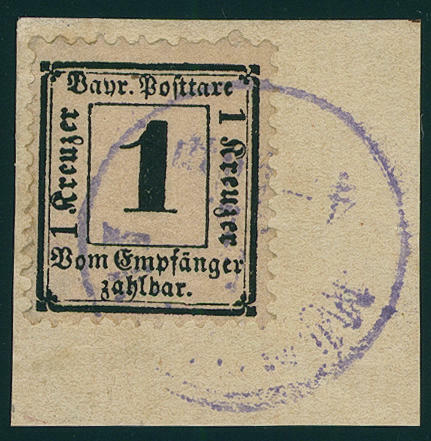 Dark lilac with overprint \"peoples state Bavaria\", fresh colors and in perfect condition on very nice letter piece with clear two ring cancel \"WUERZBURG 13. MRZ. 20\", outstanding quality! Photo expertize Dr. Helbig BPP. 4395 ∆ 1 3 Kr. 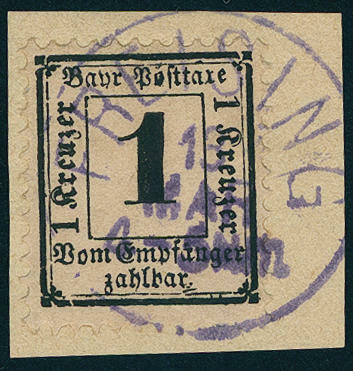 Black, wonderful having bright colors and good margined outstanding quality with enormously wide right margin of sheet (14 mm) on very nice white letter piece with clean mounted semicircle cancel \"STRAUBING\". So large margin copies are extremely rare. An exception copy for the highest standards! 4396 ∆ 1 3 Kr. 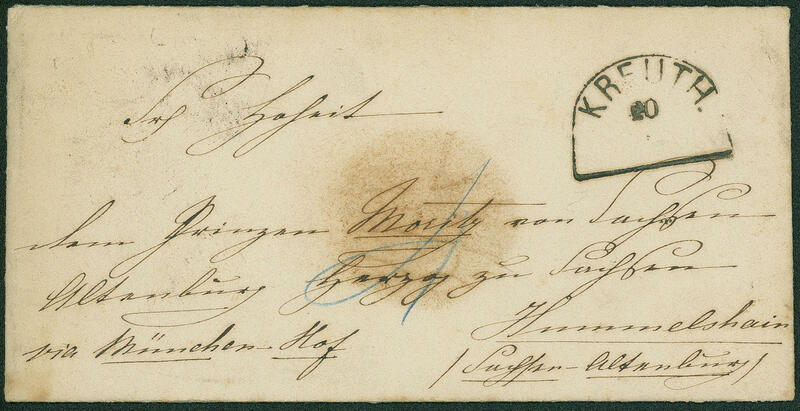 Black, having bright colors, on all sides piece in outstanding quality with enormous margins on very nice white letter piece with two clearly single circle postmark \"Munich 14. April \", expertized Pfenniger. 4397 ∆ 2X 1 Kr. 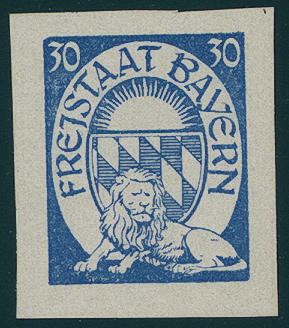 Black, watermark close lozenges, wonderful having bright colors and excellent perforated outstanding quality on magnificent letter piece with clear and straight mounted single circle postmark \"FREISING 13. MAR. \". An outstanding quality for the highest standards! Expertized Schmitt BPP. 4398 ∆ 2x 1 Kr. 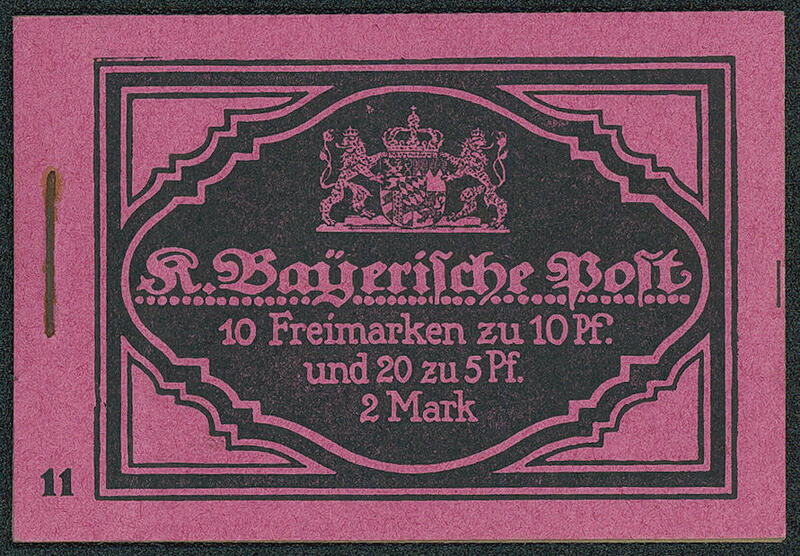 Black, watermark close lozenges, having bright colors and good perforated extremely fine copy on beautiful white letter piece with single circle postmark \"Munich\", expertized Brettl BPP. 4408 ✉ PU18A1 1 Mk. 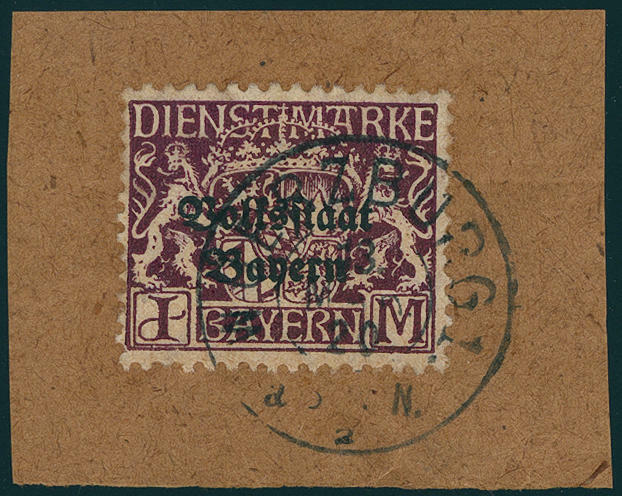 Violet, coat of arms, white, the extremely rare private postal stationery cover, in perfect condition as registered with single circle postmark \"MUNICH 38.15. February 05. 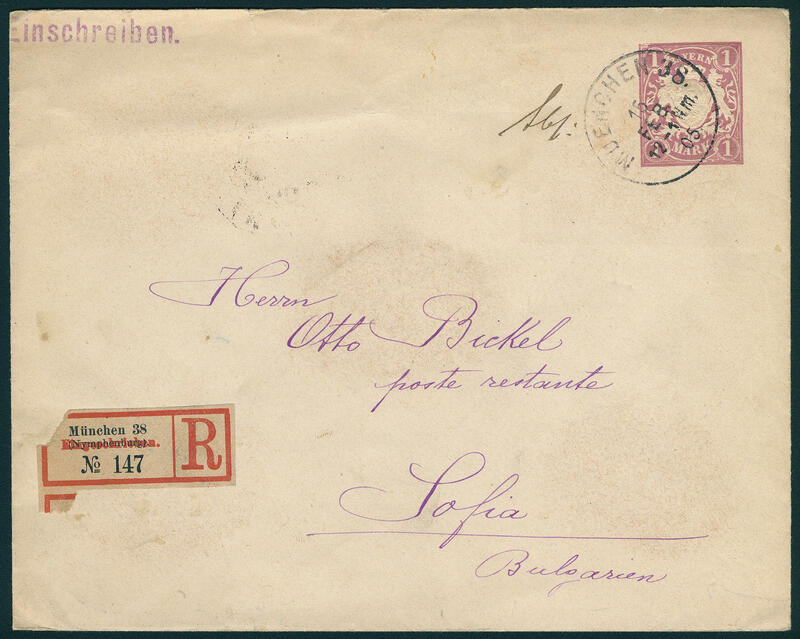 \" to Sofia / Bulgaria with arrival postmark. There are very few examples have become known. In this kind a rarity the Pfennig period! 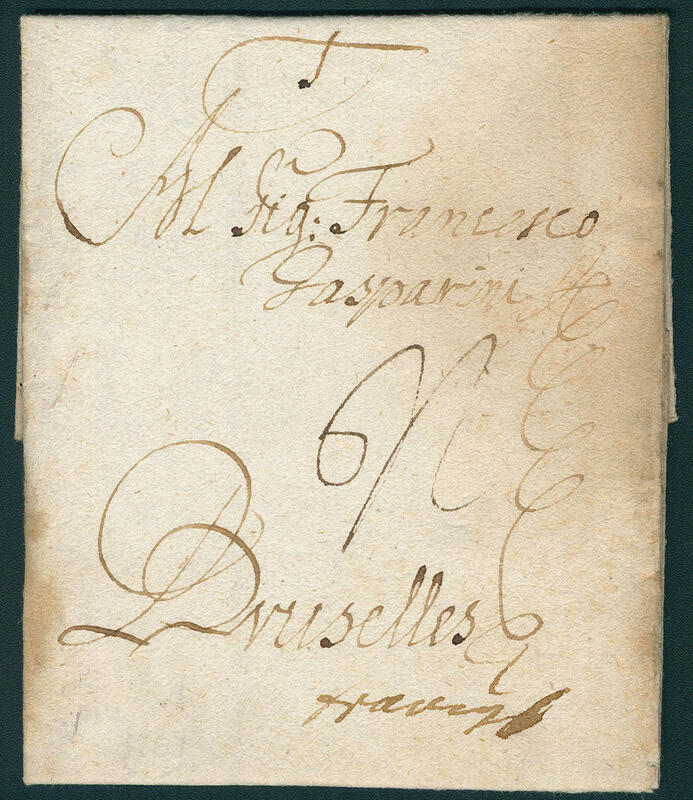 4281 ✉ \"MONACO (Munich) \", interesting cover from 1698 with complete content, on Italian written, to Brüssel / Belgium. 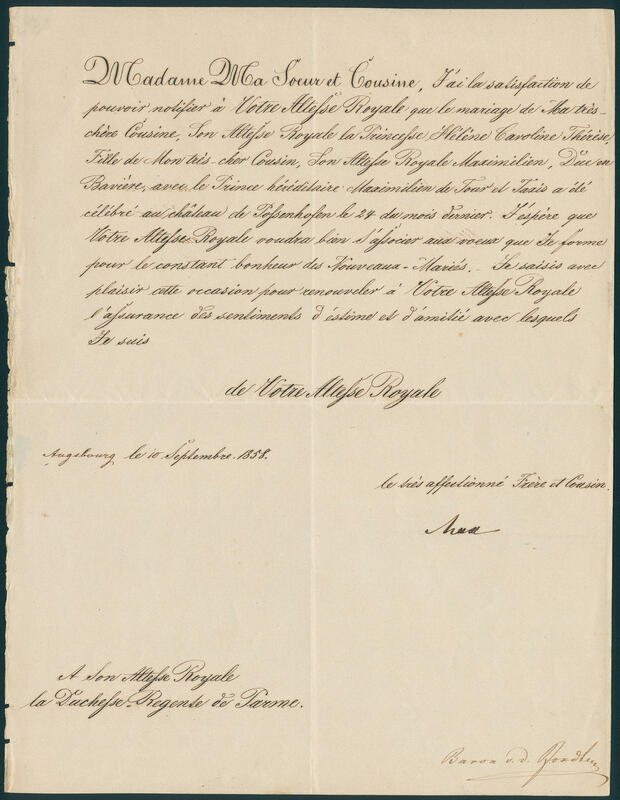 A rare early international letter! 4403 S1.5,S1.8 Stamps the cabbage respectively Dellmuth with 5 Pfg. 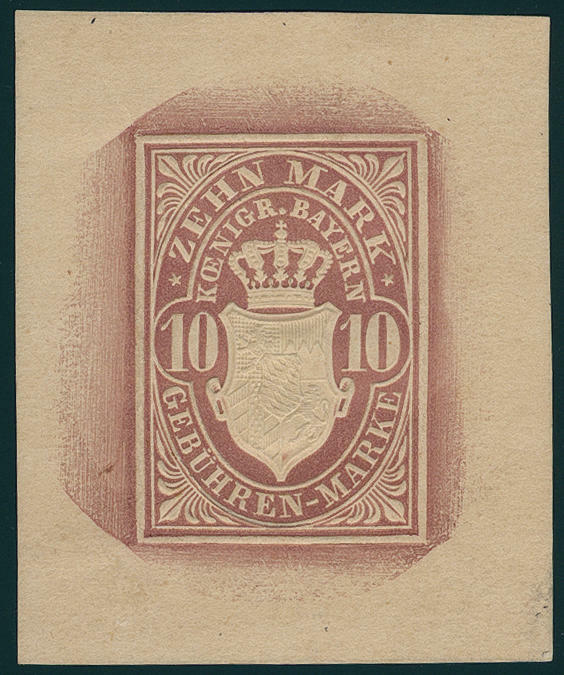 Germania, two vertical se-tenants, unfolded, in perfect condition mint never hinged Michel 185,- €. 4404 S1.6 Brad neckties 5 Pfg. 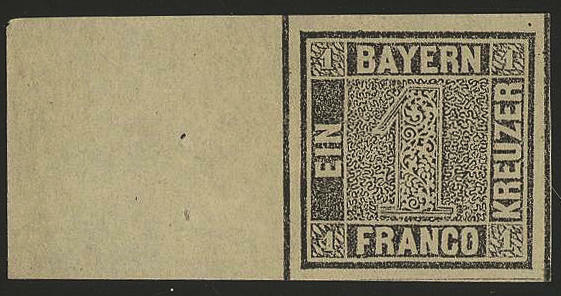 Luitpold, vertical se-tenant, unfolded, in perfect condition mint never hinged, without signs. Michel 200,- €. 4405 S5.12 Academy for brewer 10 Pfg. Luitpold, vertical se-tenant, unfolded, in perfect condition mint never hinged, without any signs. Michel 500,- €. 4411 10 Pfg. 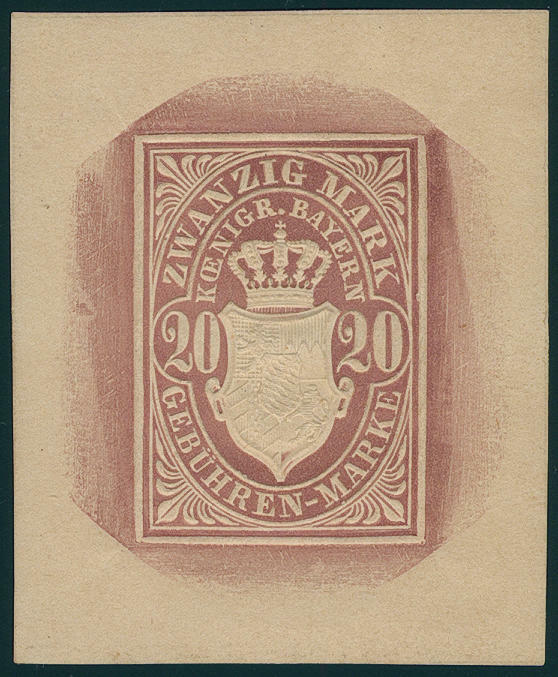 20 Mark 1882, fee stamps set of 20 each values as trial proofs in pink brown, in perfect condition on ungummed paper. All 20 values are fresh colors. In this completeness very rare! 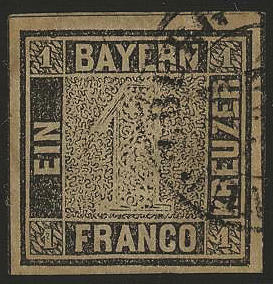 4412 \"Freistaat Bayern\" respectively \"a free people outdoor Country\", six various essays cut, in perfect condition on ungummed paper, in each case in the colours brown, orange, green, red, blue and violet, in total well, 36 essays. 4413 ✉ King Maximilian II. From Bavaria, personal signature (Max) on an officially cover to the duchess from Parma regarding the wedding from princess Helen carolean Therese from Bavaria (sibling from Sissi) with heir to the throne Maximilian from Thurn and Taxis, written in Augsburg at the 10. September 1858. A magnificent historic document of prime rarity! 4409 4b Prince regent Luitpold 1913, the very scarce stamp booklet black on light reddish purple, wonderful fresh colors, unfolded with the original clip, however content only partial available, with a complete stamp booklet pane 3 (advertisement stamps Paul the cabbage). Michel for the complete stamp booklet 5000,- €. 4410 5b King Ludwig III., stamp booklet 1914, booklet cover dark blue on light greenish gray with serial number 1, fresh colors, unfolded and in perfect condition mint never hinged in utterly perfect condition. An exception copy of this rarity for the highest standards! Photo expertize \"mint never hinged and flawless\" Dr. Helbig BPP. 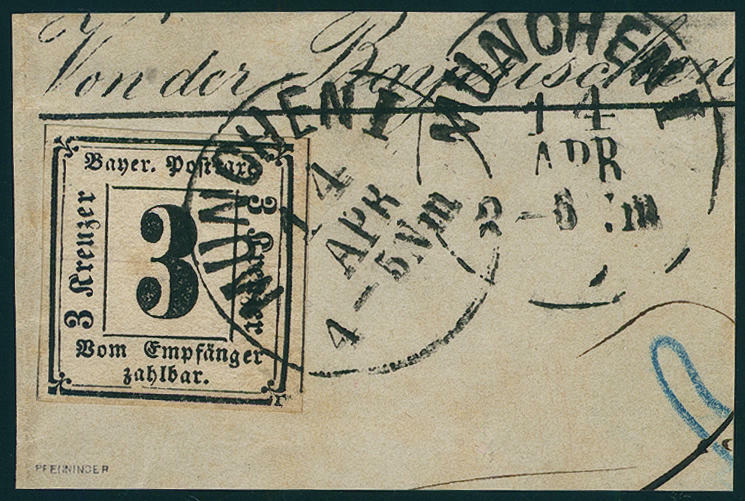 4406 ✉ \"KREUTH\", segment cancel on beautiful, post paid cover from 1865 with complete content (dated 20.8.1865) with varnish seal at Prince Maurice in Hummelsheim / Saxe-Altenburg. These prince letters were free of postage transported. Rare! 4407 ✉ \"Munich 18. MAR. 1864 XII. \", two line cancel twice neat and clear on beautiful small-format ornament letter with stamped border ornaments. 4282 1Ia 1 Kr. Gray black, plate I, wonderful having bright colors and on all sides very piece in outstanding quality with enormous margins with large left margin of sheet, without gum. 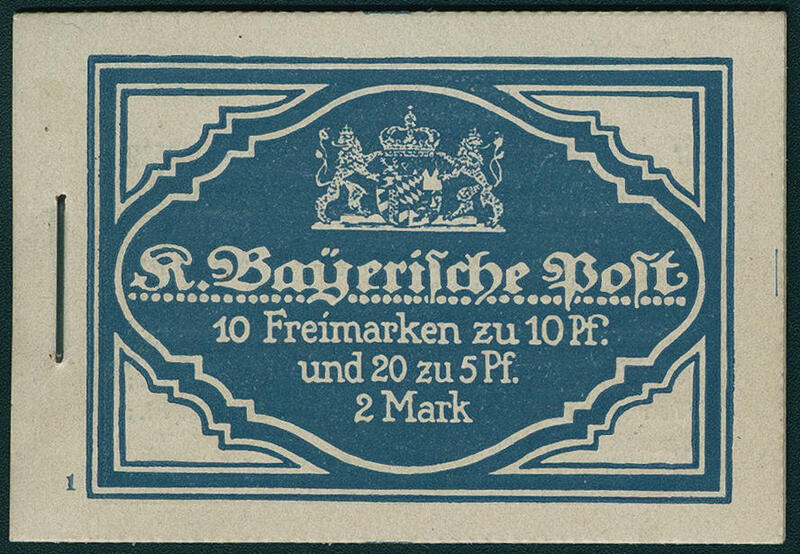 A very attractive copy of the first stamp of Germany! Expertized Brettl BPP. 4283 ⊙ 1Ia 1 Kr. 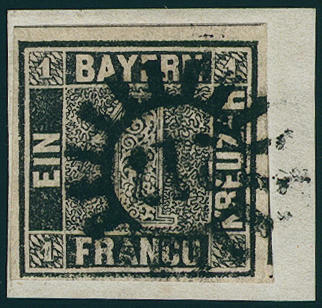 Black, plate I, effective copy with two ring cancel \"WÜRZBURG\", corrections. An impressive one kreuzer black! Photo expertize Brettl BPP. 4284 ∆ 1Ia 1 Kr. 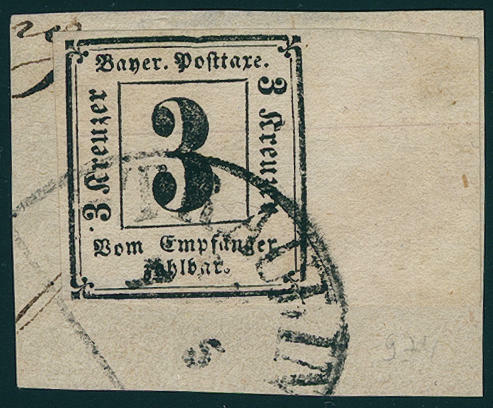 Black, plate 1, wonderful fresh colors and good margins, above with complete between line, right with parts of the neighbour, on very nice white letter piece with clear closed millwheel postmark \"217 (Munich) \". 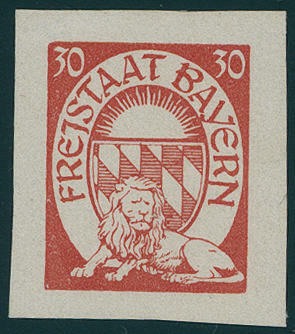 An outstanding quality of the first stamp of Germany for the highest standards! Photo expertize Schmitt BPP.